I would like to show you some of my students works today. They met and started crazy quilting only last May. Nobu wanted to make a baby quilt of 9 cqed blocks from the first time, because her daughter expected a baby in last December. She finished the wonderful gift in time. How happy everyone was!! These photos are only a few parts of her whole work. Here are Seiko's works. She wasn't used to needles at the beginning. But she loved cqing so much she learned stitching very rapidly. She has made many things. 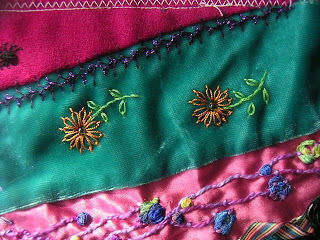 To stitch lots is the best practice. I think these recent blocks have an antique-looking very much. Very pretty. She said she had used old clothes from her drawers and colour combination was a bit random. It might have added the air. I love it very much. I had to finish Wilma's "Under the Sea" DYB block this month. She wanted a real sea, not fantasy. She also has a definite plan how to arrange her bocks when each finished. I picked up this naked block. First I started to make a background. With other blocks; Margreet's(middle upper), Ati's(right down), Helina's(middle down). Do you remember my DYB blocks titled "Autumn Roses", which were sent last autumn? They have been to get home in late March. But, but, why, I have already got them back from Helina, Finland. She is always fast!! She wanted to see my suprise. What a pleasant surprise!! What a nice friend she is!! And what beautiful blocks!! 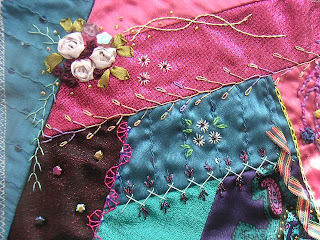 What excellent stitcher you are, Maureen, Wilma, Margreet, Ati and Helina!! Thank you, thank you, thank you!! I can't stop my happy dancing. I've never been tired of seeing those blocks in front of me. So I love CQ and RRs where I've met so nice people. 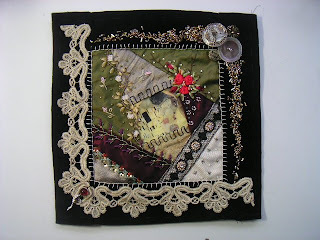 I've worked on Tami's block of FFT(Fabulous First Timers)RR from CQI. Here's the photo of the block before me. Whenever I work on RR block, I have long consideration about what and how to do, just like other cqers. To me whole balance might be the first priority. The whole balance means lots. 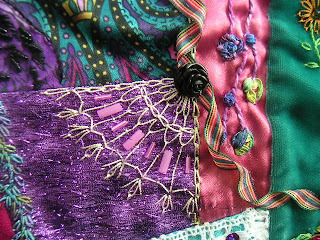 Colour, elements, materials, connection of each pieces, weight, harmony, etc. Working on RR block is always challenging and learning chance to me. I am teaching two CQ classes every Wednesday; each class every other week. A beginners class started only last May. But four ladies have already mastered block piecing and basic stitches. They are enjoying CQ very much. Sometimes we challenge vother hand craft tecniques. Cording, making tassel, croche and etc. 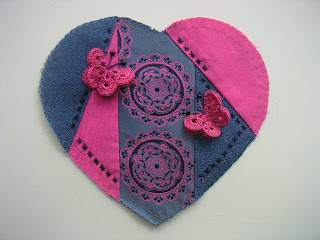 This's a beautiful heart sent to me from Margreet two years ago. 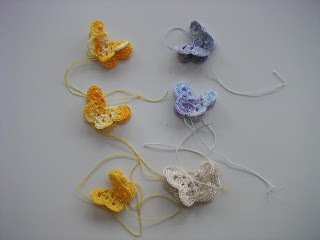 I had loved the crochet butterfly so much, we tried to make one by ourselves. Thanks, Margreet. I've made these with some different yarns. We also did cross stitch last time. After the class Tomoko sent me very pretty pictures of pinkeeper. Front. The block and butterfly on it are from me. She has arranged everything very lovely. There have been so many visitors and comments since January 26. I am so happy if I could share the pleasant time with you through this blog. I would like to say many many thanks to all of you from the bottom of heart now. On Wednesday I have a CQ class. I asked Kayoko to do drawing today and here's the result. Kathy, Karrin Hurd and Ritva, you are the winners!!! I'll email you to ask your snail mail address personally later. I wish I could have made more and send to everyone who have given me warm words. Maybe next time you'll have another chance. Thank you very much, my CQ friends!!! A comment is pointing the right answer. Can you read the signature of "GUSTAV KLIMT" I hid from the pic yesterday? You all must know him, who is a so popular artist. Japonism was the trend not only in Vienna but all over the Western world in the end of 19th century. I made this block last summer but have been hesitating to show it here because of the copyright. I am still wondering if we can use an art in our work directly like this. I appreciate there's someone who knows and teach it to me. 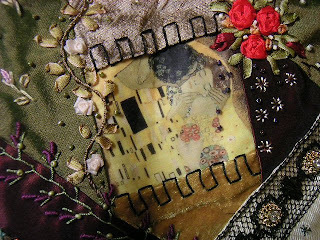 If you visit to Lin Moon's blog, you'll see another quilt inspired of the same work of Klimt. Lynn Gaskill has tagged me for 6 Picture Meme. Thanks Lyn, I am so honored. I am expected to show you the 6th picture of 6th folder out of my PC albumn. So here's mine. My 6th folder is "Images" and 6th subfolder is "Arts" and this is the 6th pic in it. It's one of pair, so I'll show you another(the 7th) too. I picked up them from some site on the net before. They looked like so Japanese I was interested in. Now I've deleted the signature of artist. Who do you think he/she is? Guess and comment. I'll tell you the name in my next post.